Texas Online Radio: Tornadoes; What you need to know. Helpful info from FEMA. Tornadoes; What you need to know. Helpful info from FEMA. Tornadoes are nature’s most violent storms. Spawned from powerful thunderstorms, tornadoes can cause fatalities and devastate a neighborhood in seconds. A tornado appears as a rotating, funnel-shaped cloud that extends from a thunderstorm to the ground with whirling winds that can reach 300 miles per hour. Damage paths can be in excess of one mile wide and 50 miles long. Every state is at some risk from this hazard. Tornadoes are most likely to occur between 3 p.m. and 9 p.m., but can occur at any time. 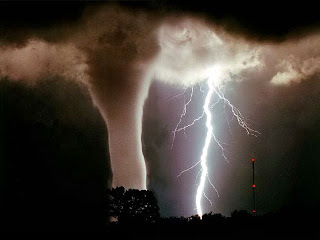 Tornadoes - Nature's Most Violent Storms? How can I protect myself from a tornado? Hit your browsers "back" button after viewing a link.